Here’s a PDF version of the image above. Ashburton’s Methodist congregation has moved out of its stunning building in the heart of the town, and the (grade 2 listed) building is up for sale. A group of town residents has got together to form ‘Ashburton Arts’ which we hope will be able to raise the funds and interest needed from across the region to buy the old church and turn it into a new Community Arts Centre and work hub that will become a destination venue for performing and visual arts that will attract people from across Dartmoor, Torbay and the A38 corridor to the town for events of all kinds, including top touring musicians and theatre productions, a regular cinema showing the latest films plus art house classics and live relays from the world’s top theatres and concert halls. We plan to make it a hub for all kinds of musical and performing activities in the town, both amateur and professional. We also intend to respond to the need in the area for high quality work hub space for freelancers and those working from home – fast internet, printing and meeting/video-conferencing facilities. The prime location in the centre of town makes it a perfect place for small farmers’ markets and playing a big part in Ashburton’s burgeoning carnival and festival diary, and generally contributing to the community every day of the year. Over 200 supporters have already signed up. If you’d like to join them, add your email below. To sign up as a supporter of this project, type your email address here, then click ‘Join’. This will add you to the mailing list. Your email will not be given to anyone else, and you can easily unsubscribe at any time. Hi, we plan to move to Ashburton as soon as we sell our house. I would like to pledge a loan of £1000 towards securing the Methodist building for Ashburton arts. Fantastic Nigel – thank you! We’ll send you a mail to sort it out. This site is in it’s very early days! 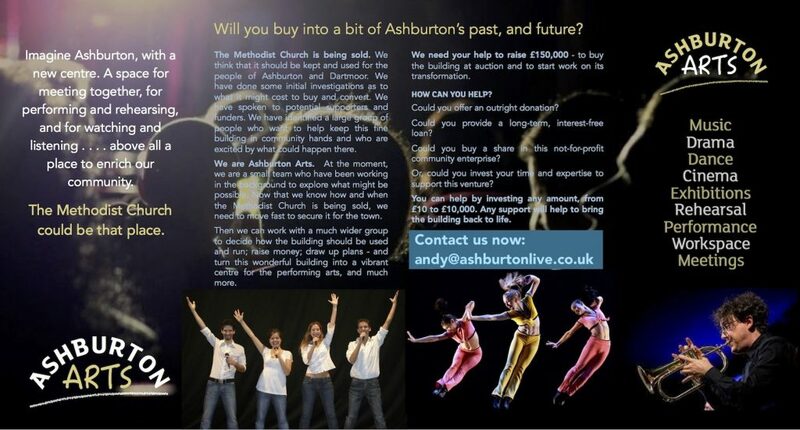 If you’d like to get in touch, send an email to andy@ashburtonarts.org.uk or call 07980 680052.